An odd question, right? Firstly given that we are just in the first month of the new year when so many people are tackling new goals and ambitions for 2015 and secondly, given that I am someone who is all about setting life visions, achieving goals and having the discipline to follow through – especially when things are hard and challenging. But I have good reason to ask this of you now. Many people in the hype and excitement of a new year set ambitious and lofty goals, which; at the time seem like a good idea. The first group gives up on their intentions as soon as things become inconvenient and hard – which really means that their goal did not fit into the true vision they had for their life, it wasn’t that important to them. The second and very small group is in it for the long haul. These are the select few who made wise commitments and will do the work, no matter what to achieve their goals, enjoying both the triumphs and challenges along the way because what they are working towards does fit into the grander vision they have for their life. And for most it probably is. But there is such a stigma in our society about quitting. 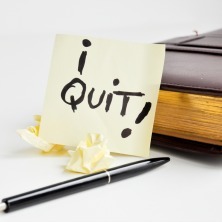 People who quit are often portrayed as losers, weak, lacking discipline. But if we don’t give up what is wrong for us then how will we create the space for what is right for us. Arianna Huffington has a wonderful perspective on this as well – she says that sometimes the best way to finish a project is to quit. I love that! But I will never quit because something is hard, only if it is wrong for me. And this I believe is the most important distinction to make. You see the thing is, hard work and discipline and overcoming challenges and hardships to achieve something that is integral to who we want to be and what we want to accomplish in life is admirable. But working and struggling for years and years doing something we do not love and that we don’t see, as part of our ideal future is not – it’s a compromise for what we truly want. And if you don’t quit you cannot create that empty or white space for that which is right and intended for you. So rather than looking at quitting as being a “loser” look at it in this way: that it is a positive process of choosing a path that best serves your higher purpose and good. We need to get over our belief that quitting is a bad thing. You need to find the courage to move ahead even though it may be into the unknown, having the confidence that you will be able to figure things out. You need to move on without anyone else’s approval to change what you know is right for you. Because consider the alternative – to be stuck and trapped doing something that brings you no joy or fulfillment and that at the same time compromises your mental, emotional and physical health. It makes no sense! So once you make that decision to quit set yourself a deadline and stick to it. The timing will never be perfect so you may as well get to it. Maybe it’s a 6-month plan; maybe it’s a year – during which time you need to put certain skills, resources or support in place. Maybe it’s immediate. But whatever you do, don’t stick around in a doomed endeavor longer than you should in order to justify your original decision and the possible time, money and effort already put into it. Learn from the experience and move on. So consider now what you currently spend your days doing. Are the things that occupy your life moving you closer toward the life you want and what you want for yourself and are you doing those things in the best way for you or are you doing things because you started it and are too stubborn or fearful to quit? For example, I think few would disagree that quitting one way of doing something when you find a better, more efficient way is a bad thing or when you realize that maybe running marathons isn’t the best way for you to stay fit, healthy and injury free. And most would agree that course correcting your life is hardly quitting but incredibly smart – something we should always be doing as grow and learn more about life and ourselves. So get honest with yourself, be responsible in your decisions but make decisions that will support your best and higher self and purpose in life. And if you’re still not sure about quitting or looking for permission, ask yourself this: “If I could start over knowing what I know now, would I make the same choice?” BAMM! You have your answer, you have your permission! Previous PostWellness trends for 2015 – what’s it going to be?Next PostIt’s time to show up!